ATTO's revolutionary mechanism allows it to fold to a trolley suitcase and be split into two lightweight parts. The beauty is in the details, with standard features like a built-in USB charging port and deck storage. Price excluding VAT.(Incl. VAT £3,360) *VAT Relief available on this product. The ATTO portable mobility scooter from Moving Life provides a stylish and high-tech design with excellent features. The unique folding action allows the ATTO to be folded down to the size of a suitcase within a matter of seconds. Once it’s folded, you can split the scooter into two parts so it’ll fit in small storage spaces. Also, you have the option to keep it folded in one piece and pull along like a suitcase through airports and stations. With customised brushless motors, the longevity of the ATTO is assured; this will certainly stand the test of time. 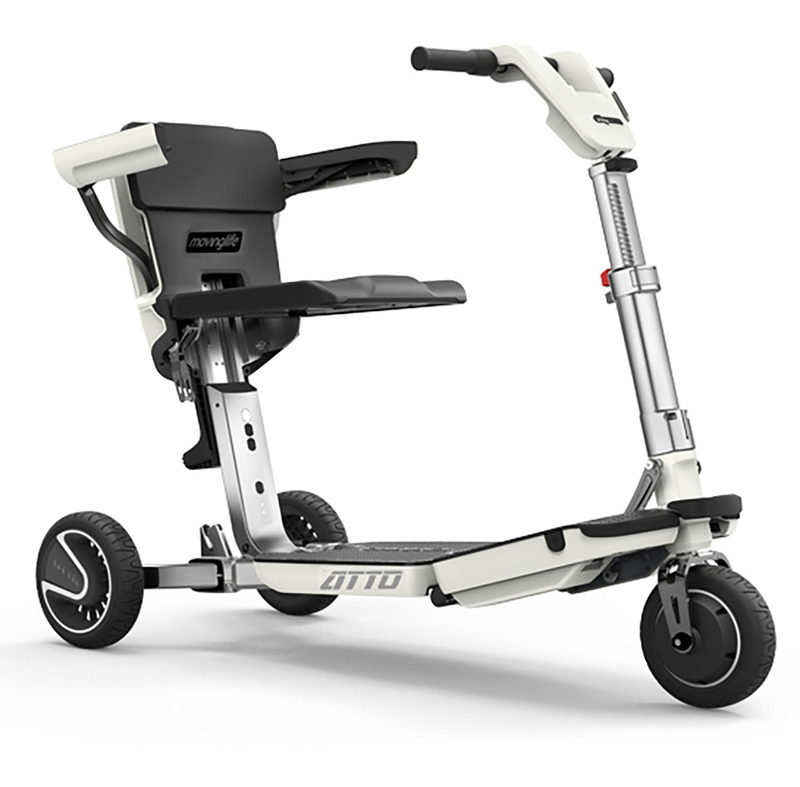 When being used as a full-sized mobility scooter, the ATTO is suitable to be used indoors and outdoors. A 56 cm (22”) footboard provides excellent stability. The seat and handlebar height can be customised so that everyone who drives it will find the optimum driving position. This scooter comes complete with FDA approved lithium battery technology, which will provide a travel distance of up to 10 miles (16 km). You’ll also only need to charge the battery for 4 hours – either on or off-board to benefit from a full charge. The beauty really is in the details; with standard features that include a built-in USB charging port for your devices and deck storage for personal items. If you’re interested in the ATTO scooter or any of our portable mobility scooter range, please call us on 02392 255600. Alternatively, pop into one of our showrooms in either Waterlooville or Torquay.